By Scott Gilfoid: It’s now official that IBF, WBA, WBO heavyweight champion Anthony Joshua (21-0, 20 KOs) will be defending his title against former WBA champion Alexander Povetkin (34-1, 24 KOs) on September 22 at Wembley Stadium in London, England. This is the fight that Matchroom Boxing promoter Eddie Hearn and Joshua wanted. Unfortunately, it’s not the fight that fans were asking for. They wanted Joshua to face WBC heavyweight champion Deontay ‘Bronze Bomber’ Wilder in a mega-fight, but he decided not to take the fight. Joshua had the option to make a huge mega-fight against Wilder, who had agreed to Hearn’s $15 million flat fee offer and was willing to fight in the UK, but they still chose not to take the fight with him. They preferred the fight against the shorter and older 38-year-old Povetkin. Hearn says they took the fight with Povetkin because he’s his World Boxing Association mandatory and Joshua doesn’t want to give up his WBA title by not facing him. It’s extremely doubtful that the WBA would have stripped a popular champion like Joshua of his WBA title if he’d elected to face Wilder. It’s a crazy move on Joshua’s part to take the Povetkin fight instead of Wilder, but it shows his stubbornness. He’s willing to walk away from a ton of money in order to take a smaller, less risky match against the Russian fighter Povetkin. Joshua is used to having things his own way in negotiations. Joshua had previously been offered a $50 million guarantee to face Wilder. Surprisingly, Joshua didn’t accept the deal. Joshua won’t be making anywhere near $50 million for the Povetkin fight. Hearn is still expecting Wilder to ultimately agree to face Joshua on April 13 at Wembley Stadium. Hearn thinks that Wilder will eventually agree to the $15 million flat fee offer that he’s given him rather than the 50-50 percentage deal that he’s asking for. Hearn says that Joshua will NEVER agree to give Wilder parity at 50 percent. Wilder thinks that the fight will be made at 50-50. One of the two will need to change their stance in the negotiations for the fight to get made. As of right now, the Joshua-Wilder fight is dead in the water with no hopes of ever being made. change his mind after Wilder starts looking vulnerable in his fights. Right now, Wilder’s size, speed and punching power makes him a real threat to the Joshua express. The Joshua vs. Povetkin fight will be at the 90,000 seat Wembley Stadium in London. Joshua packed in 90,000 boxing fans to see him fight against Wladimir Klitschko in 2017. Joshua almost lost the fight after getting knocked silly by Wladimir in the 6th. It goes without saying that Joshua would have been beaten by Wladimir if the former world champion had decided to finish him off after he had him hurt. Joshua has been bringing in 70,000+ fans to see his recent title defenses against Carlos Takam and Joseph Parker at the Principality Stadium in Cardiff, Wales. It’s unclear whether Joshua can pull in 90,000 fans to see him fight Povetkin, who isn’t a big name in the UK. Povetkin has tested positive twice for performance enhancing substances in the past. This will be a test of Joshua’s drawing power to see if his fight against Povetkin will sellout the 90,000 seat Wembley Stadium. Joshua will be making his 6th defense in facing Povetkin. Povetkin is a former WBA ‘regular’ heavyweight champion. He held the title from 2011 to 2013 until losing to Wladimir by a lopsided 12 round unanimous decision. Povetkin defended the WBA title four times, beating Cedric Boswell, Marco Huck, Hasim Rahman and Andrzej Wawrzyk. Since losing to Wladimir in 2013, Povetkin has won his last eight fights against David Price, Johann Duhaupas, Mariusz Wach, Mike Perez, Carlos Takam, Christian Hammer, Manuel Charr and Andriy Rudenko. Povetkin has looked progressively worse in his last three fights, and appears to be showing signs of age at 38. But even if Povetki was still the same fighter that lost every round against Klitschko in 2013, he’d still be out of his league against the much bigger 6’6” Joshua. The size difference between the two fighters will likely be too much for Povetkin. Wladimir knocked Povetkin down four times in their fight, and he could have done more if he wasn’t fighting in a conservative manner. Povetkin looked vulnerable in his last fight against David Price on March 31. Fighting on the undercard of Joshua vs. Parker, Povetkin was given a standing eight count in round 3 after being clipped by a big left hook from Price. It was lucky for Povetkin that Price gassed out right away and stopped throwing punches. If Price was six years younger, he likely would have stopped Povetkin on the spot. Age has done a number on the 35-year-old Price’s stamina. He’s not the same guy that he once was in the conditioning department. Joshua vs. Povetkin pits two Olympic gold medalists against each other. Joshua, 28, won an Olympic gold in the super heavyweight class in the 2012 Olympics in London. However, Joshua’s gold medal was highly controversial, as he appeared to lose three of his fights during the competition against Roberto Cammarelle, Ivan Dychko and Erislandy Savon. In Joshua’s fourth fight against Zhang Zhilei of China, he appeared to be held to a draw. With the 2012 Olympics taking part in London, Joshua had the crowd cheering madly for him during the competition. Whether the cheering swayed the scoring by the judges is unclear. It looked to me that Joshua lost all of his fights. In contrast, Povetkin won a decisive gold medal in the 2004 Olympics in the heavyweight class, beating Sergey Rozhnov, Murtarkhan Dildabekov, Roberto Cammarelle and Mohammad Aly. Povetkind did a much better job against the Italian Cammarelle than Joshua did in beating him by a controversial decision in 2012. Povetkin came close to challenging Wilder for his World Boxing Council title in May of 2016 in Moscow, Russia, but the fight fell apart after Povetkin tested positive for a banned substance. 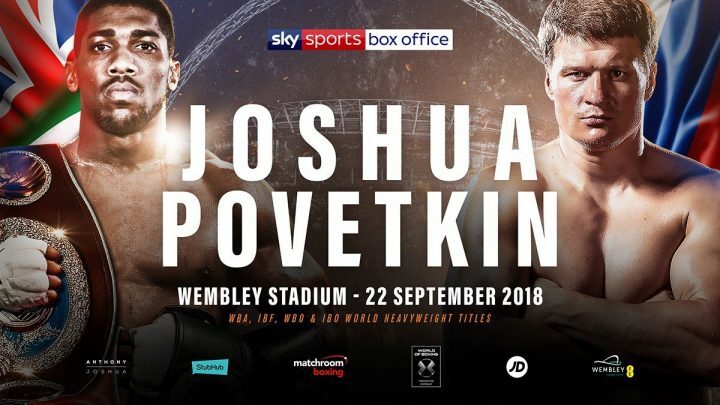 Joshua vs. Povetkin will be shown on Sky Box Office PPV in the UK. Hearn has a news conference this week on Tuesday, and it’s believed that he’ll announce that Joshua-Povetkin will be streamed on DAZN in the U.S. The subscription service is rumored to sell for $9.99 per month in the U.S. Given that Joshua and Povetkin aren’t big names in the U.S, it’s unlikely that the fight will be seen by many boxing fans in the States. Fans aren’t going to want to spend $10 to see a fight that is a mismatch on paper.